Bath MBA students travelled to Pall Mall, London, earlier this month to hear from four senior business speakers. This was part of a regular series of business trips for the students, designed to enhance their academic studies. Ian started the day's talks with a discussion on business banking and the role a bank like Barclays has in the modern business environment. He looked at how 'local' banks are changing into strategic partners that participate in management information, facilitating and enabling effective decision-making. This new dynamic is different from the old days of merely being a high-street retail bank. It's one that new entrants to the market, such as internet banks, can't replicate easily. Rowan discussed how the CSP Practice confronts large scale challenges of resilience, risk sharing and sustainable growth for governments, international institutions and corporates. 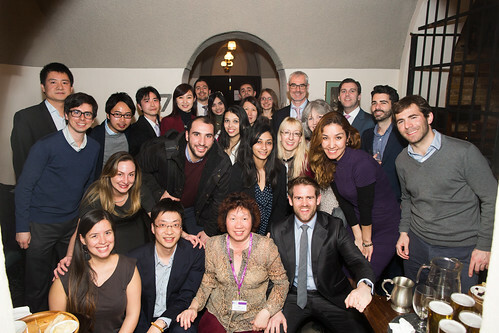 Willis Tower Watson has funded research in several universities, including Bath, for the development of their financial decision-making. Being involved in both science and capital has led them to work with government on policy development in recent years. John talked about his 25 years working in the City, and his 'boutique' investment company Zeus. Their most successful investment was floating online fashion company boohoo.com. This raised £300 million. Kevin presented to the students on the role of CISI in the financial markets. He gave an overview of the Institute, spoke about the roles and responsibilities of finance leaders and the industry's ethics. If your organisation is interested in working with our MBA students, please get in touch.